Last week’s posting discussed Senator Dianne Feinstein’s challenging Point Reyes National Seashore Supt. Don Neubacher’s plans to close Drakes Bay Oyster Company. County supervisors had asked Feinstein to intervene after hearing from members of the public, including UC Berkeley biologist Corey Goodman, who revealed the park administration had misrepresented research to justify closing the company. On July 21, Feinstein toured the oyster farm with owner Kevin Lunny and Supt. Neubacher, as well as convened a meeting in Olema of top Park Service officials, National Seashore officials, Lunny, Supervisor Steve Kinsey and others. The upshot of the meeting was that Lunny can now get the permits he needs to improve the oyster operation. Four days earlier, Congresswoman Lynn Woolsey had written Supt. Neubacher, saying his plan to imminently start exterminating the axis and fallow deer herds in the park was unjustified. She disputed his administration’s claim that park research showed the growth of the herds has reached crisis stage. Nonetheless, extermination has now begun. Perhaps the park has displayed its most outrageous chutzpah when it claims the fallow and axis deer eat too much brush, thereby depriving the blacktail deer of food and the threatened red-legged frog of riparian habitat. In fact, there is such a buildup of brush in the National Seashore that it has become a fire hazard. Why do you suppose the park each year holds all those controlled burns? As for threats to the red-legged frog, the main two dangers are from bullfrogs and the National Seashore administration. The park’s policy of converting historic stockponds from freshwater ponds to saltwater lagoons amounts to eliminating primary habitats for the red-legged frog. Indeed, when the park was initially discussing plans to convert the Giacomini Ranch to a saltwater marsh, the Neubacher administration acknowledged it would be wiping out red-legged frog habitat but said not to worry; there’s plenty more elsewhere in the park. At the time, the administration boasted that one of the largest populations of red-legged frogs in California is in the National Seashore. A much greater threat to red-legged frogs than non-native deer are non-native bullfrogs, which eat adults and tadpoles. Scientists have noted that much of the park’s red-legged frog population has been displaced by bullfrogs, which are found in ponds throughout the park. Hundreds of bullfrogs can be found in some Olema Valley ponds. 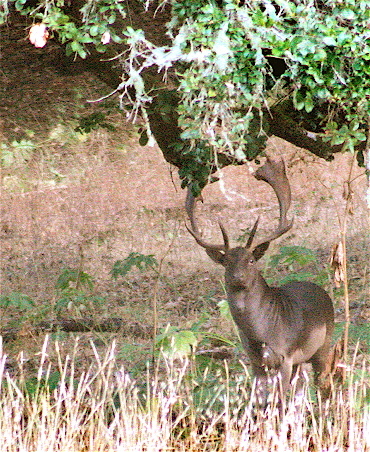 A brown fallow buck displays his moose-like antlers. Neubacher became superintendent after a citizens advisory commission appointed by the Secretary of the Interior held hearings in which the public and scientists from across the county determined the optimum size of the herds. Their conclusion? Approximately 350 deer apiece. What followed, however, were periodic public outcries over methods used in culling the herds. • In the 1980s and early 1990s, rangers claimed 90 percent of the deer they killed were going to St. Anthony’s Dining Room to feed the poor. 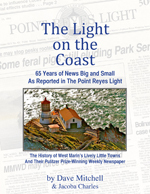 In 1992, however, when The Point Reyes Light invoked the Freedom of Information Act to check the park’s culling records for the previous eight months, it turned out that only 29 percent of the deer shot had been ending up at the soup kitchen. Deer slain where rangers would have had to lug them a ways to reach a vehicle were left where they dropped. The National Seashore earlier this year said it will donate the slain fallow and axis deer to the Redwood Empire Food Bank in Santa Rosa and the St. Vincent de Paul Society in San Rafael. It now says the Hopper Mountain National Wildlife Refuge in the Central Valley will get some of the meat to feed condors. The park would like the public to think that all the meat will go to these organizations. Past experience suggests otherwise. 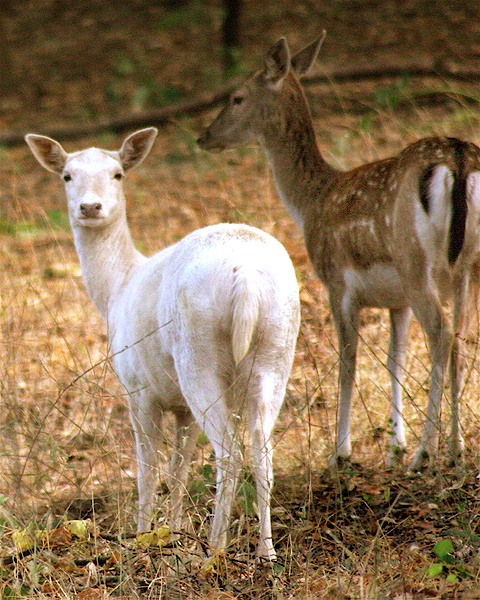 A white fallow doe, whose ancestors lived in the Near East, and a spotted axis doe, whose ancestors came from India and what is now Sri Lanka. Rancher Doc Ottinger in the late 1940s acquired the original members of their herds from the San Francisco Zoo, which had a surplus, and brought them to Point Reyes for hunting. So what is really going on? Despite Congress’ intent when it voted to create the Point Reyes National Seashore, the Neubacher administration is in the process of creating a Disneyland-like facade of wilderness. In the process, much of the cultural history of West Marin is being obliterated. The narrow-gauge-railroad town of Hamlet has been razed, the pioneer town of Jewell has been wiped out, historic barns have been torn down in the Olema Valley, attempts are underway to end 150 years of oyster growing in Drakes Estero, and the 65-year-resident herds of fallow and axis deer are threatened with extermination. All this reminds one of Taliban zealots in 2001 blasting apart two 6th-century Buddha statues carved into a cliff. The Taliban considered the the 125- and 174-foot-high sculptures non-Islamic and, therefore, out of place in Afghanistan. From the end of the last ice age 11,000 years ago until the National Seashore was created, elk and — since the Gold Rush — cows kept Point Reyes in grassland. However, the park has eliminated grazing on hundreds of acres, which have now become brushed over with coastal chaparral. As this happens, rare plants that can only live in grassland are endangered. Grassland rodents disappear, thus reducing a key food source for eagles, hawks, and owls that had hunted the fields. The environmental damage to the grassland ecosystems of former pastures seems to matter less to the park administration than making the landscape look wild. However, this artificial wilderness bears no resemblance to what Point Reyes had been like since the Pleistocene Epoch. The Neubacher administration would appear to imagine that the tule elk, which the park reintroduced to Point Reyes in 1978 after a 110-year absence, will eventually become numerous enough to replace cows on the point. But it’s all Fantasyland. If elk numbers ever got that high again, the park would need to reintroduce 15,000 Miwoks, as used to live in the area, to cull the herd through eating a lot of venison. In contrast, the herds of cows the elk would displace can be, and are being, efficiently culled — by the ranchers who own them. It’s time that more members of Congress than just Woolsey and Feinstein pay attention to the park administration’s repeatedly thwarting the will of both Congress and most of the public. So far, the Neubacher administration is shrugging off Congresswoman Woolsey’s letter opposing its plan to eliminate the fallow and axis herds. The time to act is now. Professional riflemen have already begun shooting deer. Readers need to email Woolsey via http://woolsey.house.gov/contactemailform.asp and request she organize more support in Congress for these exotic creatures. I’m doing a little history research for an elderly cousin, James Codding, about a great great grandfather, Alva Jewell, son of Omar Jewell. 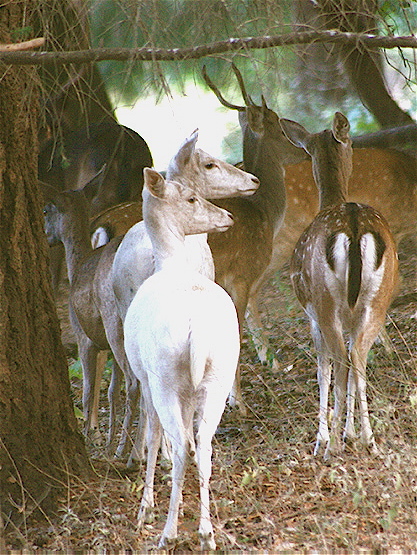 I ran into a discussion of the exotic deer on your blog. I worked for then Fish and Game in the 1970’s and was collecting fallow, Axis and some blacktail deer in the course of screening for parasites and diseases to see if there were any transmissible to tule elk. We were scrupulous about processing animals we collected for St. Anthony’s mission kitchen. Sorry the Park Service wasn’t as scrupulous. Sparsely Sage and Timely is powered by	WordPress 4.9.10 and delivered to you in 0.420 seconds using 52 queries.